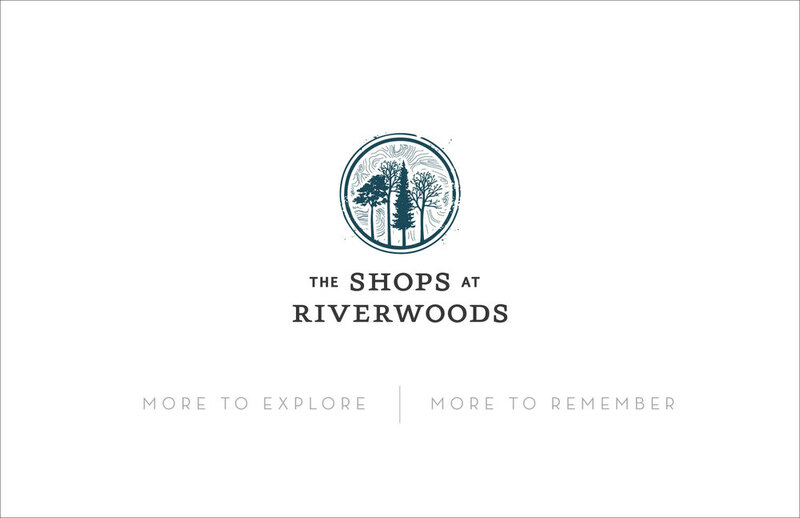 The Shops at Riverwoods is an upscale retail center located at the base of Mt. Timpanogos and the mouth of Provo Canyon. It features boutique shopping, dining, and lifestyle retailers in a beautiful outdoor setting. Previous branding was inconsistent, corporate, and plain. This rebrand effort focused on creating an identity that reflected the natural beauty of the center, the unique product offering, and its role in the community. This branding was in place for a number of years, after which the Shops unfortunately discarded all branding efforts and became just another mall. Which it is. For this project I was able to use my academic background in economics and business strategy to determine the brand direction. I went back to the fundamental strategic questions of "Why do we win in our market?" and "How do we win?" 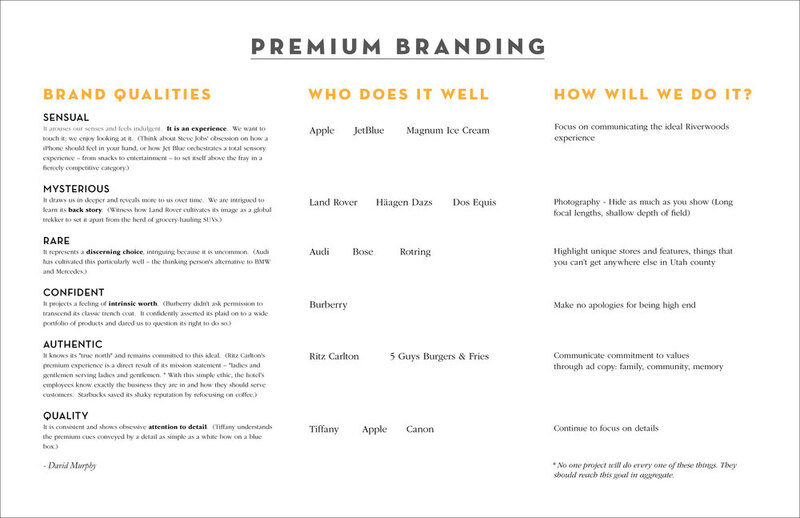 I also read up on the scholarly research in premium brand equity and product line extensions. 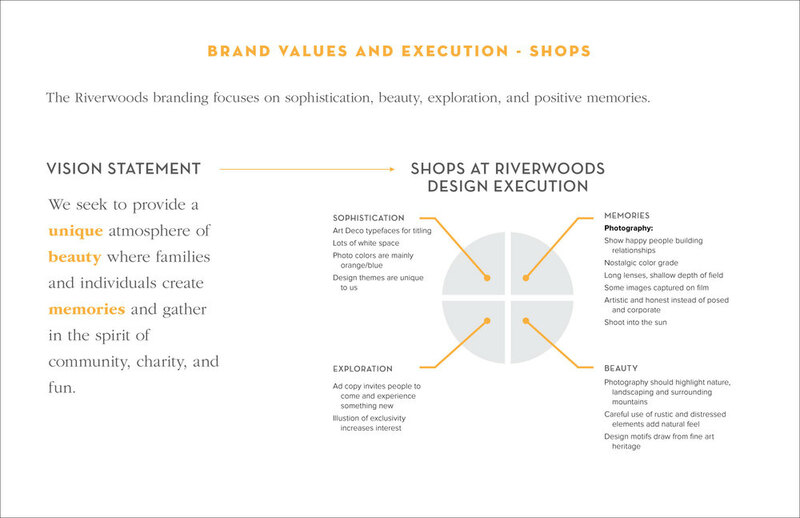 This research, along with Clayton Christensen's jobs-to-be-done framework informed the final strategy: the Shops at Riverwoods must maintain its upmarket image while at the same time inviting new customers to experience its upgraded shopping, dining, and lifestyle options. Every subsequent design decision aimed to fulfill these two goals which were reflected in the new tag-lines "More to Explore" and "More to Remember."